This part of the tour focuses on the High Street area of Christchurch that has a long history but unfortunately the redevelopments has destroyed most of the visual evidence. The wide High Street, in which the Monday Market dating from Saxon times and is first mentioned in a Charter from the Earl of Devon in 1149, is still held, was the site until 1871 of the Borough’s two annual Fairs. The Priory or Trinity Fair held on Trinity Thursdays in early summer and the three day St. Faith’s Eve Fair held in October. Fairs had been essential in medieval times for the supply of technical and long distance goods like tools and spices. The railway brought larger populations and the ability to supply shops for the increased populations, this is why the fairs were suspended in 1871. Between 1902 and 1938 trams ran down the High Street having come from Poole. They were followed by trolley buses, which have also gone. However, evidence of the Tram Turntable can be seen on the Priory Area Tour. The High Street was also a site for public punishment. Thieves could be whipped for a hundred yards through the market. Other punishments included the Ducking Stool which we have just visited and the Whirly Gig. These latter two instruments were kept in the North Porch of the Priory when not in use. From the Old Market Square walk up the left hand pavement of the High Street passing in front of Bookends. To your left you will pass a number of points of interest. The first build on interest that you pass to your left in NatWest Bank, which is a fine Victorian Masion built by James Kemp Welch, who was a Surgeon. On the Christchurch Blue Plaques Millennium Trail Leaflet1 this location is identified as number 35 but no Blue Plaque has been erected. 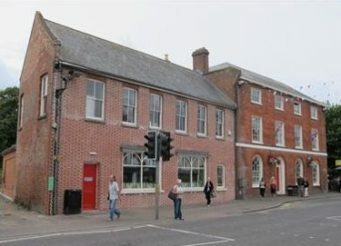 This building, shown to the left of The Regent Centre in the picture, has been significantly altered but was built in 1843, like nearly all of the High Street was reconstructed at the time that the railway arrived in Christchurch and the wealth that it brought to the town. Notice the lady’s faces at the upper corners of the first floor windows. On the Christchurch Blue Plaques Millennium Trail Leaflet1 this location is identified as number 36 but no Blue Plaque has been erected. 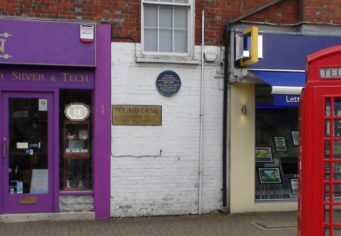 Slightly further up the High Street is the Regent Centre that started as the Regent Cinema, opened with great ceremony at the end of 1931, with the first installation in the county (Hampshire then of course) of Holophone musical colour effects. 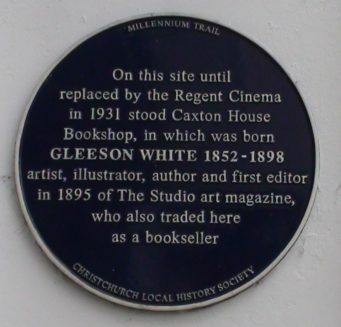 Before the Regent Cinema was constructed the Caxton House Bookshop stood on the site, in which Gleeson White, artist, illustrator, author and the first editor of The Studio art magazine traded as a bookseller. When the popularity of cinemas declined it became a bingo hall but was eventually put back to its former use and now hosts every sort of entertainment imaginable with a new extension at the back completed as the Borough Council’s Millennium project. On the Christchurch Blue Plaques Millennium Trail Leaflet1 this location is identified as number 37 . Walking further along the High Street you will see, slightly set back the Library. The next interesting building, dating from 1844, is the Christchurch Library, known locally as the Druitt Library after its benefactor. It was built for a dynamic and influentual young solicitor, James Druitt, who went on to become a major force in all the town’s affairs, being Mayor no less than five times. Busy in every way – he had 15 children – he was also father of Herbert Druitt, a talented antiquarian with a deep love for history of his home town and an avid collector. The large building was once the house of the Druitt family in the 1840’s to the 1940’s. After Herbert’s death in 1943, several tons of books, paintings, fossils etc which filled every corner of the house had to be sorted and cleared. His sister Charlotte left the house to the town as a Library. It has been a part of the County Library Service since 1952, in Hampshire to 1974 and now Dorset. 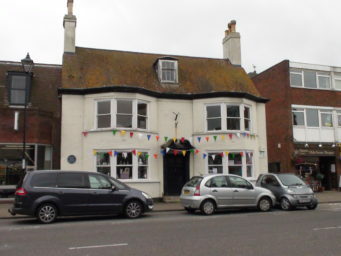 The Christchurch Local History Society operated the Local History Room on the first floor from 1989 to 2011. On the Christchurch Blue Plaques Millennium Trail Leaflet1 this location is identified as number 41 but no Blue Plaque has been erected. Walking further up the High Street the other side of a small access road into the Druitt Gardens is the next building of interest. Further up the High Street the other side of a small access road into the Druitt Gardens and where the library entrance building is was once a school from 1829 until 1867 is the Masonic Hall. This Hall was built by Samuel Bayley, a draper of Christchurch, for the Lodge of Hengist in 1837 – a venture which eventually bankrupted him. Note the ornamental urn on the top, and the oversized doorway – probably surviving pieces from the earlier Winton House before it was rebuilt. On the Christchurch Blue Plaques Millennium Trail Leaflet1 this location is identified as number 42 but no Blue Plaque has been erected. Opposite stood the Bar Gate at the main entrance to Christchurch at the edge of the New Forest. Also on the line of Saxon town walls once stood the Green Tree Inn. Behind it, in 1971, excavations revealed Saxon occupation including a corn dryer which had used Roman roof tiles. So there must once have been a substantial Roman building, at Christchurch, perhaps where the Priory is now. A thin scatter of Roman material has been found throughout the area. On the Christchurch Blue Plaques Millennium Trail Leaflet1 this location is identified as number 43. 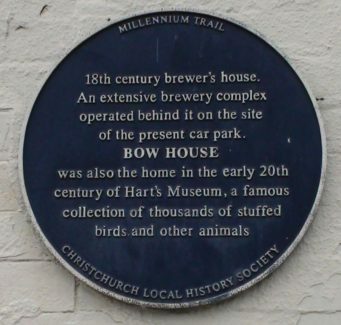 Brewery House, which was located with Bow House, at the junction of Barrack Road and Bargate priory to the building of the Christchurch Bypass, culminated in a junction in front of which a group of shops jutted out into the road almost a far as the central refuge. 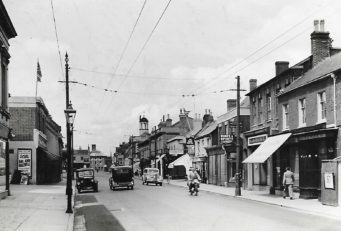 It made the High Street almost an enclosure for annual fairs. Note how wide the High Street is here Brewery House stood on or close to the site of the Norman Bargate. On the Christchurch Blue Plaques Millennium Trail Leaflet1 this location is identified as number 44 but no Blue Plaque has been erected. 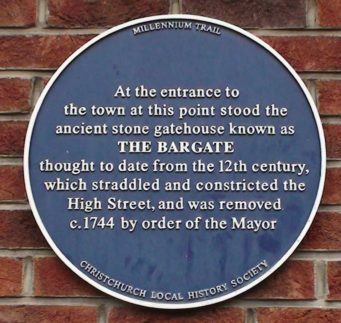 It is now necessary to cross the High Street using the designated crossing point with central reserve to find the Plaque on the shop wall that commemorates The Bar Gate. The Normans called the taxation area, or Hundred, based on Christchurch as Edgegate Hundred in Domesday. The gate was removed in 1728. By then its function would have been ceremonial. The Normans had probably slighted the Saxon town walls when they built their castle about 1074, to help enforce the new Forest Laws. On the Christchurch Blue Plaques Millennium Trail Leaflet1 this location is identified as number 6. By walking towards The Fountain Roundabout you will come to the end of High Street and by turning right enter Pound Lane. This is the site of the original Town Pound where stray animals were kept for their owners. An amusing story about the pound, a fenced enclosure for stray animals, concerns a powerful landowner who tried to claim some common land by making a replica stag and placing it on the common. The locals would have none of it and promptly seized the fake animal impounded it with straw and water but were outwitted by the landowner’s men who rescued it by means of a pulley and winch. 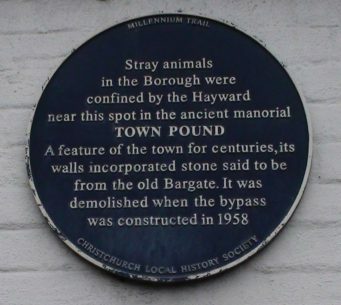 The Pound and the stray animals were kept by the Hayward who was also the Town Crier. The Pound was demolished in 1958 to make way for the New Bypass. The site is now part of route to the underpass to Bargate, which is visited on a separate virtual tour, and the footpath to Saxon Square. On the Christchurch Blue Plaques Millennium Trail Leaflet1 this location is identified as number 5. 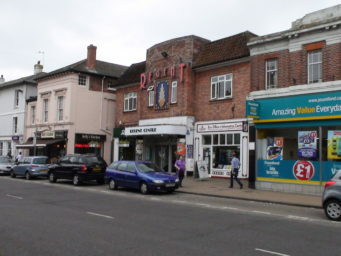 The tour completes by walking along Pound Lane and turning right passing the Travelodge to locate the ramp on the left into the Saxon Square Car Park.